This one day June 25th, 2016 event seen great summer weather with a light breeze, a sunny sky and temps in the 80s. I counted 21 sails on the water for the first race. A good sign was there were 5 new racers in the beginner fleet! Hopefully they will all return next year. As usual everyone got at least one raffle prize and many got two. Three races were ran before pizza lunch and two after lunch. The wind was slowly building and a few people even got up on a plane on the way in for lunch. Unfortunately after lunch the winds started to diminish again. The lovely award medallions were hand made with care(picture below). The award presentation and raffle were completed about 5:30 and then many of the group headed to a local establishment for drinks and food. 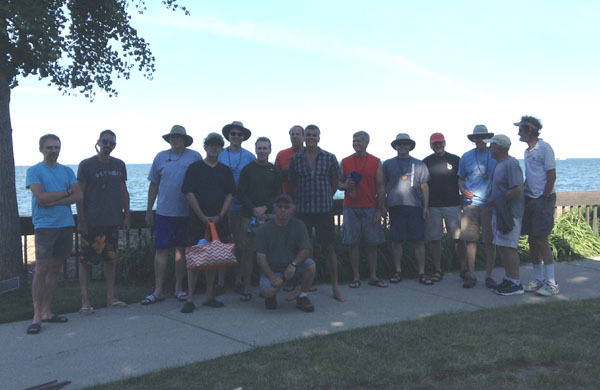 Fourteen experienced racers battled in light winds Sat June 15, 2013 on Lake St. Clair just a mile from the mouth of the Detroit river. Four races were ran during the morning session, then a pizza lunch break and another long single race after lunch. 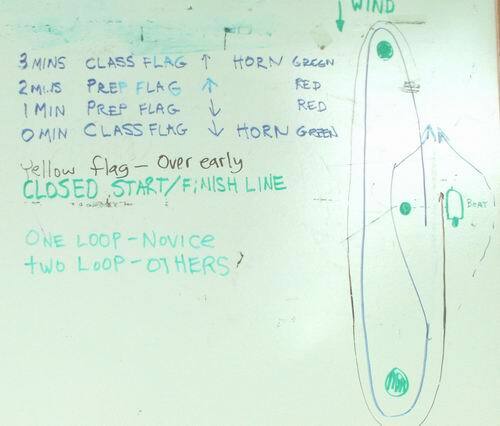 The “I” course used was large which made downwind sailing skills a must have. 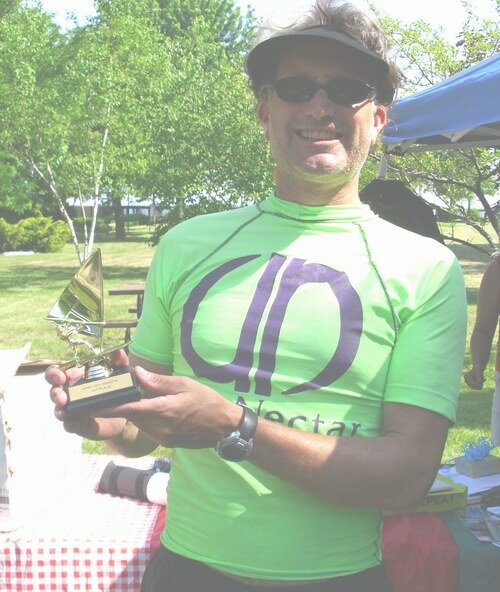 Gordon Bittle from Columbus Ohio for the second year in a row took fleet and longboard class honors using a 1980′s Mistral Superlight I and a 2008 Mistral Prodigy one design 8.5 sail. Nat Siddal won hybrid class on a Mistral Prodigy using the Prodigy one design 8.5 sail. 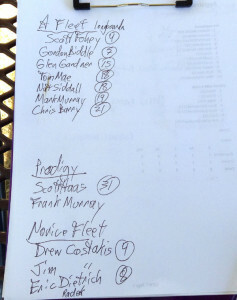 Of note also is that Ted Schweitzer took 4th in fleet using his Original Windsurfer with it’s 6.2 One Design sail besting several others using 8.5 and 9.5 sail sizes. Missing this year were any novices whose registration fee is waived. What is so hard about sailing in a circle? That’s what one of the event hosts below “Frank Murray” wants to know. Come on beginners get out on the course, we would love to see you! From the course you have a great view of the mansions along lake St. Clair, rumor is that Kid Rock lives just down the shore a bit. 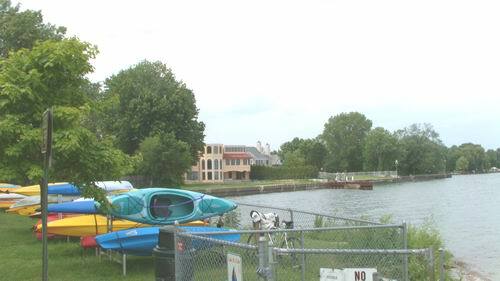 Patterson Park has a magical calming effect on people, it’s the summer spot for local Grosse Pointers to hang out at and kayak, SUP or windsurf from. The Grosse Pointe Windsurfing Club managed to come up with a nice set of raffle prizes again this year. Everyone walked away with something. Below Nat tries out a raffle chair. 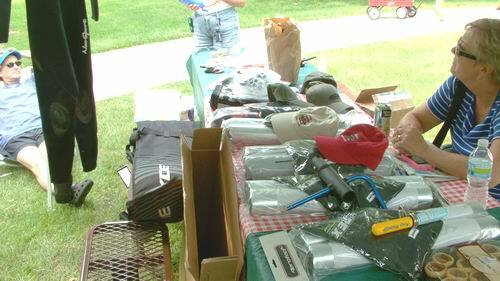 Other prizes included a wetsuit, Dakine mast bag, Chinook Rig Winch, Aerotech rack pads, and much more. We hope to see a few beginner novice level racers in 2014. Usually the set up is the A fleet will do two laps and the Novice Fleet just one lap. There is nothing hard about sailing in a circle. Clear skies greeted contestants at the Saturday June 18th Grosse Pointe Windsurfing Club regatta. The event is held at Patterson Park on Lake St. Clair just north of downtown Detroit Michigan. Nat Sidall won the Prodigy class and was fleet overall champion this year. Nat Sidall displays his 1st place trophy. Longboard class was won by Mark Murray, Rod Clevenger won the Senior Prodigy class and Ted Schweitzer won the Original Windsurfer class. The event was international again this year with three Canadian contestants. New and old designs fight it out at the finish line. Five long two lap races were ran in a three hour marathon morning session. After lunch break racers were greeted with very low winds. The R/C decided to call it and we were glad for that as there is a slight current here which can make getting around certain legs extra difficult in light winds. Windsurfing action continues in Michigan June 25 with another race in the Original Windsurfer series held in Traverse City Michigan. No race equipment? No problem as several new Original Windsurfers are available. Any board is welcome .. come join the fun at one of Michigan’s best summer tourist destinations. Wow .. a lot of racing action is scheduled in September. Be sure to check the MOWIND calendar. It’s good to contact organizers a few days out to check things are on schedule. The notice of race flyer for the Sept 25-26 Fall Wind Power Championships windsurf regatta in Fond du Lac is now available in PDF format. Hope to see you there. This is the 1st race in the 2011 MOWIND point series of races. Results of the 2010 MOWIND points series will be presented during the Saturday evening dinner at the Sunset Club in Fond du Lac. On Friday Sept 24 the free Winnebago Supercrossing long distance race takes place so check the flyer out for details on that. 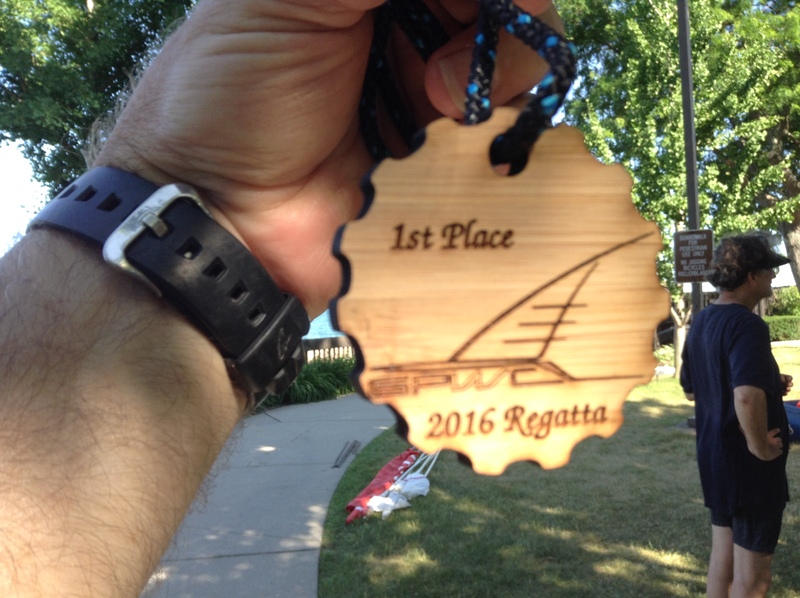 Also coming up Sept 11-12 is the Higgins Lake Regatta in Roscommon MI. That event is held at Higgins Lake South State park campground. General public and non-racers are welcome, show up and reserve a campspot by the beach for the day, rig and sail. Join the group for a fun dinner excursion on Sat evening. Race headquarters will be located towards the west end of the campground around lot 350. As usual the GLWT (Great Lakes Windsurfing Tour) people plan to be there with demo gear and deals on demo equipment. So if you are a non-windsurfer .. this is a great opportunity to find out more about windsurfing and make some new friends. Sept 18 is the date for the 5th race in the Canadian Ontario Sailing Race Series. 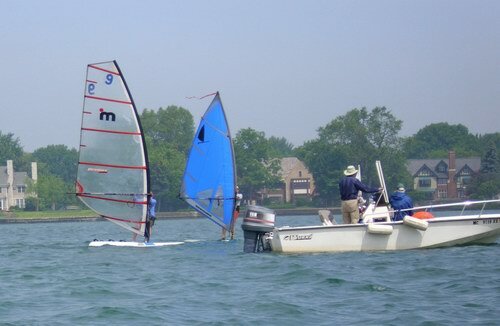 This one day race is held at the Toronto Windsurfing Club facilites. 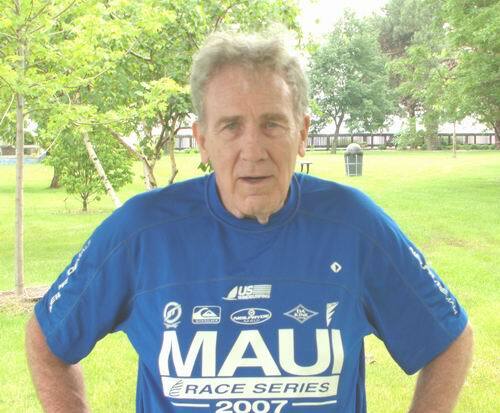 The following day on Sept 19 the 17km TWC Mammoth Marathon long distance race around the Toronto islands is scheduled. Several Mowinders from the Ohio and Michigan have attended these races in recent years. Toronto is about a 245 mile drive from the Detroit, 295 from Cleveland.